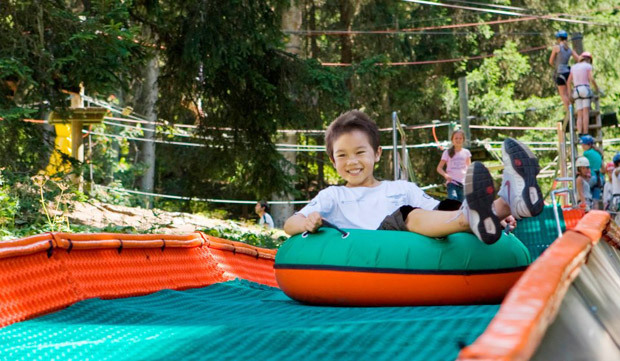 The Fun Activities at Adventure Play! 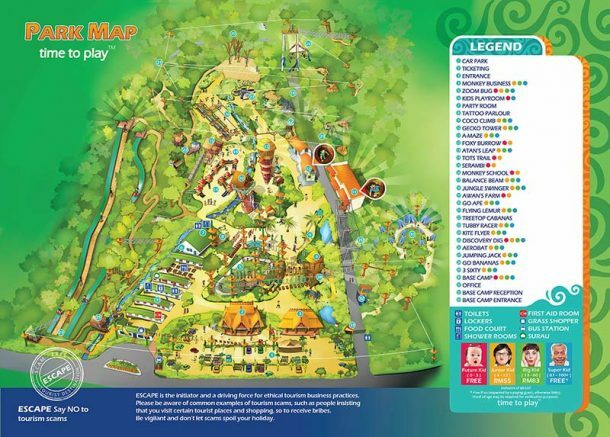 Penang Escape Theme Park Atan’s Leap, become like Atan (the hero of the park) and leap through the air. Experience the exhilaration of an exciting rapid descent with a featherbed landing secure in the knowledge that our safety procedures are second to none. 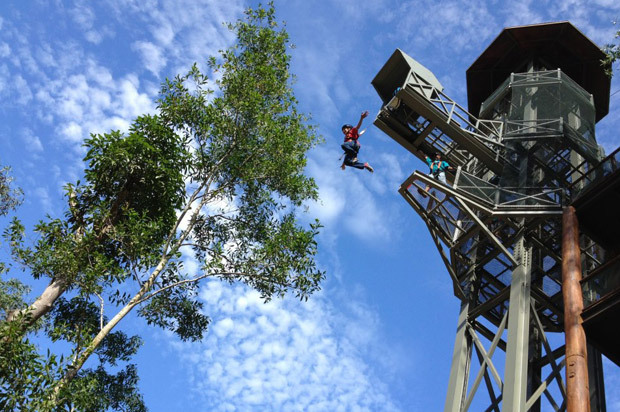 Penang Escape Theme Park Monkey Business, learn to climb like a pro and perfect your balancing skills on this challenging rope course. 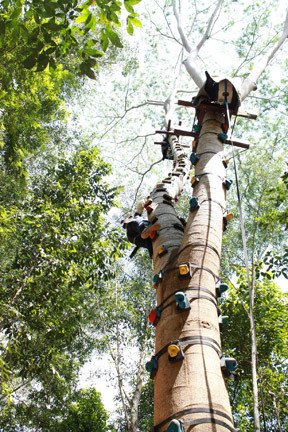 There are three levels for you to try and it’s suitable for monkeys of all ages as well as for team building. 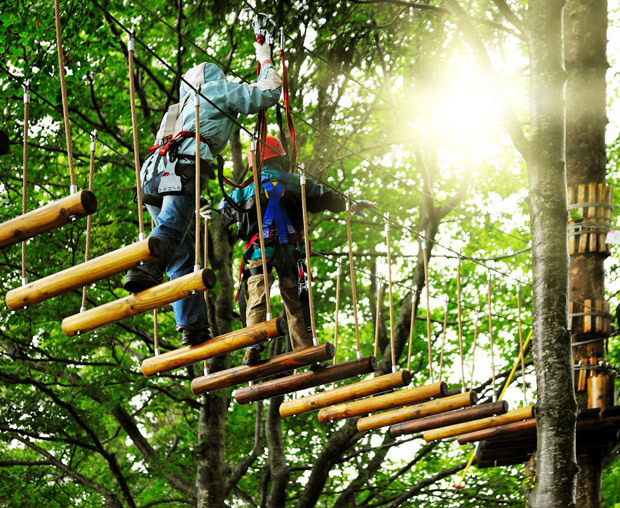 Penang Escape Theme Park Go Ape, climbing trees will bring out the young ape in you! You can climb quietly and enjoy the view as you go or friends can race each other to the top. This activity is for all ages – and the auto-belay harness ensures your safety at all times. 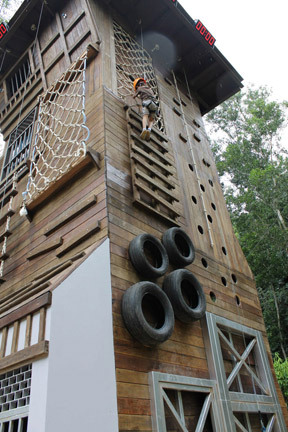 Penang Escape Theme Park Gecko Tower, Become as sticky footed as a gecko on this climbing tower. You choose your own path to the top, safe in the knowledge that there is an auto-belay system in case your geeko feet lose their grip! 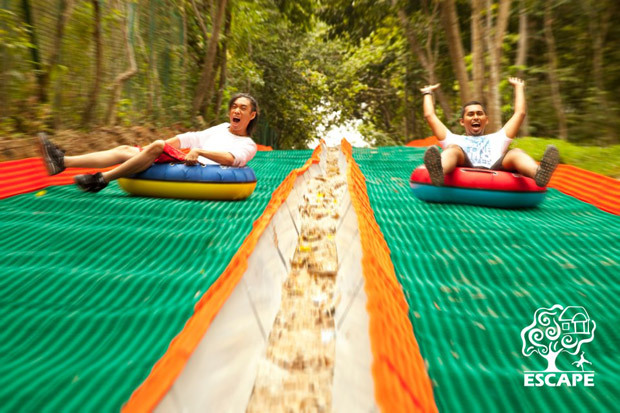 Penang Escape Theme Park Tubby Racer, enjoy an exhilarating journey downhill on the back of this tubby tube. You can even link several tubby tubes together for more fun than any family should have! Penang Escape Theme Park Zoom Bug, it’s always fun to go-kart and this one is human-powered which adds to the challenge! 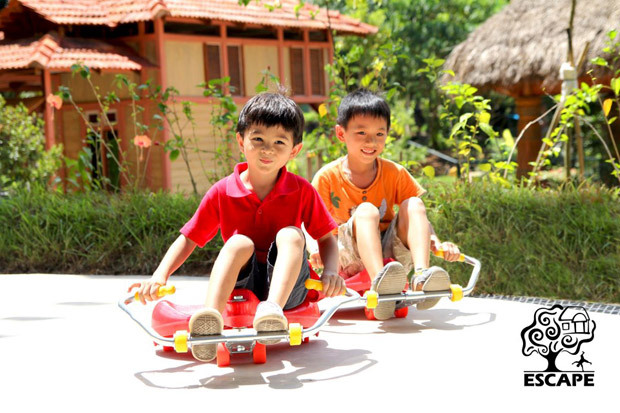 You can race or just have fun going fast and making hi-speed turns on this highly manoeuvrable ride. Note to parents: it’s very addictive! 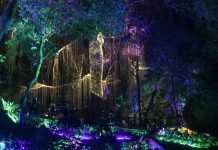 Penang Escape Theme Park Foxy Burrow, caves are exciting – and this themed one even more so. 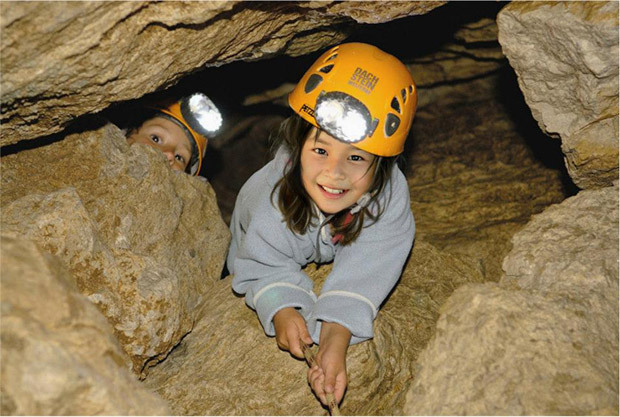 You will have to climb over rocks, squeeze through gaps and duck under obstacles to complete this caving adventure! Don’t worry – the safety equipment will protect you from any harm. 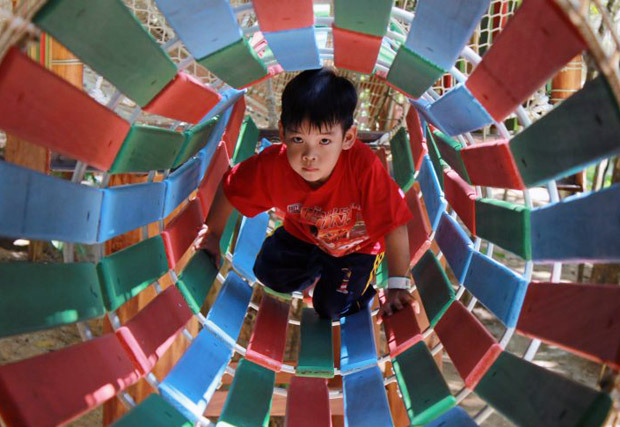 Penang Escape Theme Park Tots Trail, if you’re a young child you will love practising your climbing, crawling and balancing skills in this multi-activity play structure. 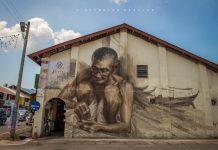 Penang Escape Theme Park Discovery Dig, Pan for treasure in this activity which takes you back to the early days of Malaysia’s mining history. You will need to bring out the secret prospector within you to find the gems and ‘gold’ hidden in sand, soil and streams. Tattoo, get a fun tattoo – don’t worry, they’re not permanent and will fade in a week. Our experienced tattoo artist will spray the tattoo of your choice onto you. A Junior Kid Passport holder may be accompanied/supervised by a Super Kid free of charge. 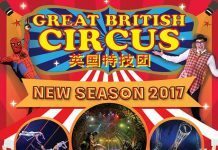 Promotional rates of RM320 (Adult) for annual pass (Passport) for unlimited entries. 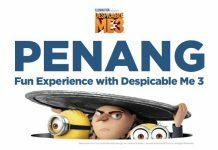 Promotional rates of RM240 ( Kids 4-12 years old ) for annual pass (Passport) for unlimited entries. 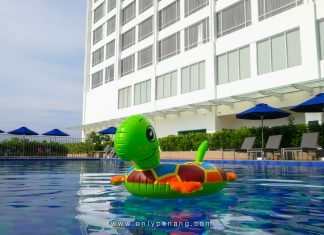 Please visit Penang Escape Website for more info. 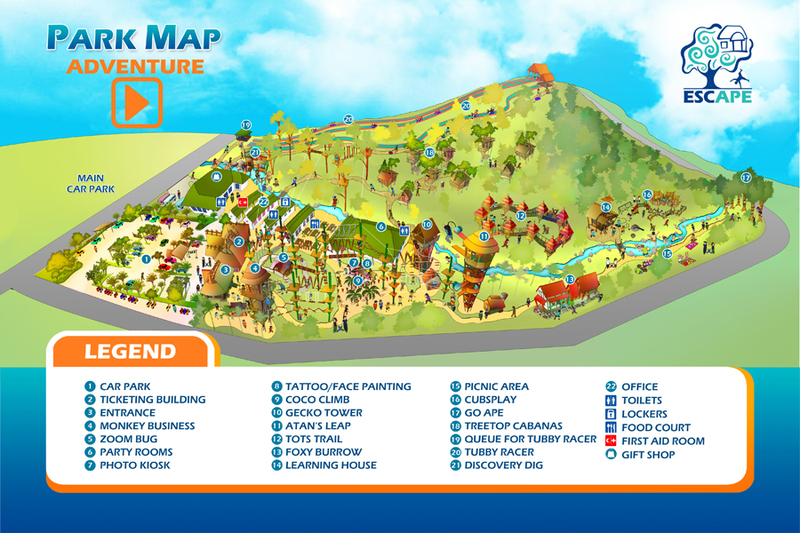 Penang Escape Eco Theme Park opening hours: 9am – 6pm, Tuesday to Sunday. Catch Rapid Bus No. 101 or 102 to ESCAPE at 10 minutes intervals. 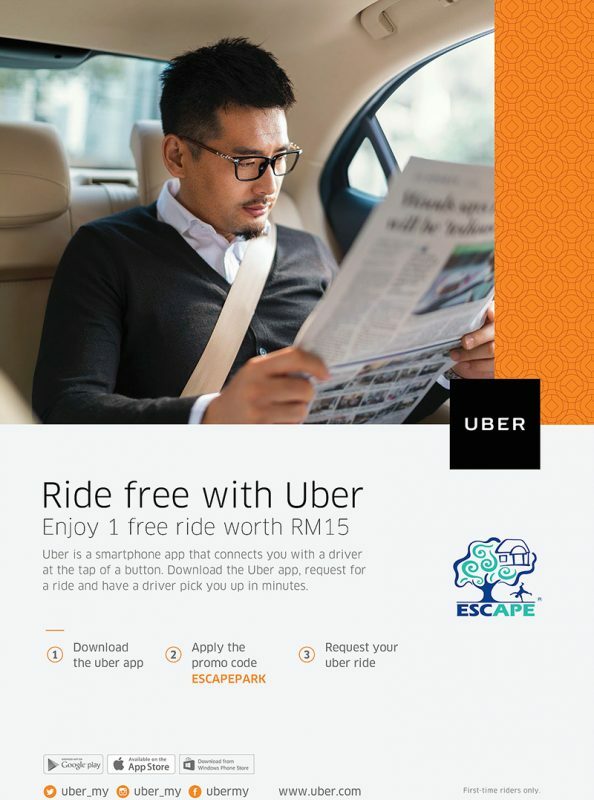 Pay first, redeem your bus fares at ESCAPE entrance. 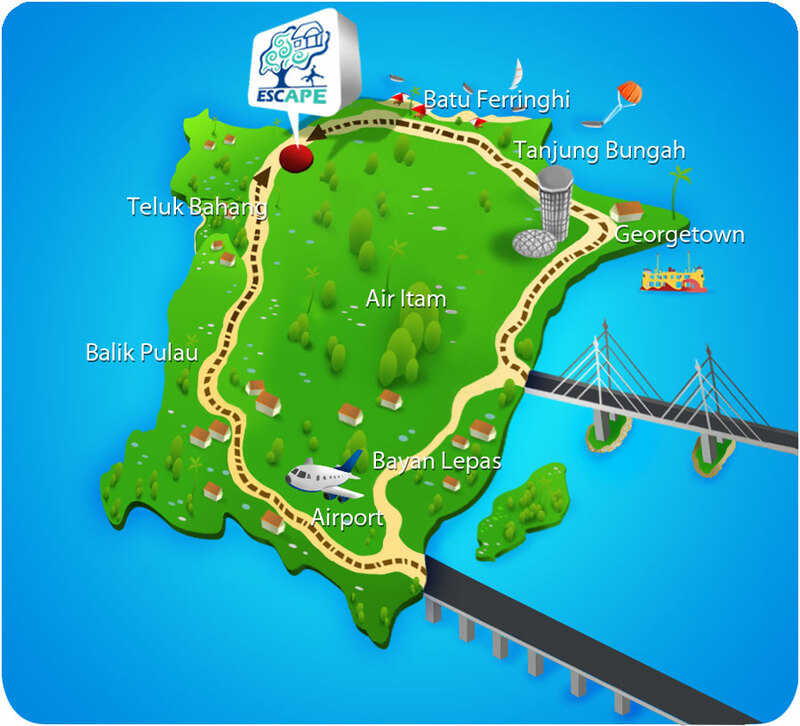 A joint Green Initiative by ESCAPE & RAPID Penang. Can I knw the hotel prize? 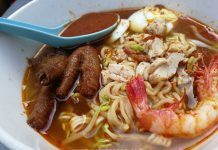 Izzit at Penang? 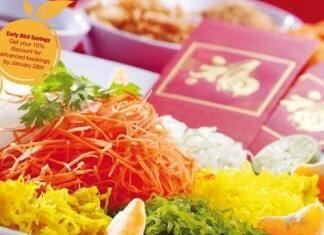 Open during Chinese New Year?so how to make a booking? In their website, yet to show hotel info yet, may try to contact them with the form below. Yeah! 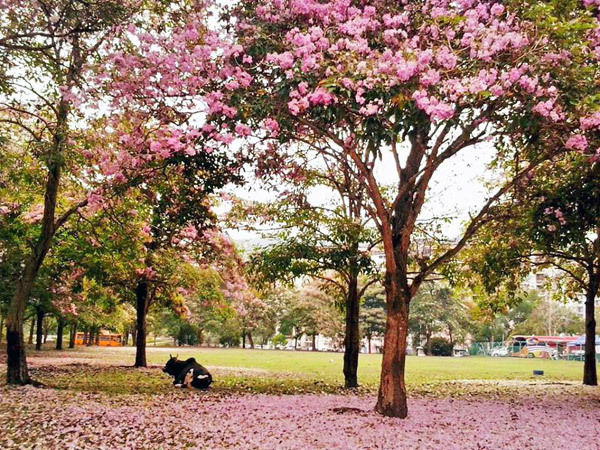 It is in Penang! 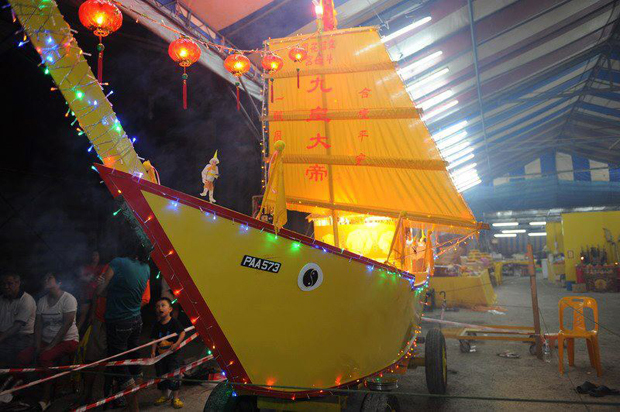 The first adventure theme park in Penang! 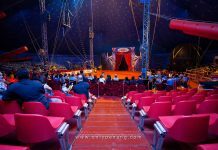 does the ticket of adventureplay and waterplay are seperate??? 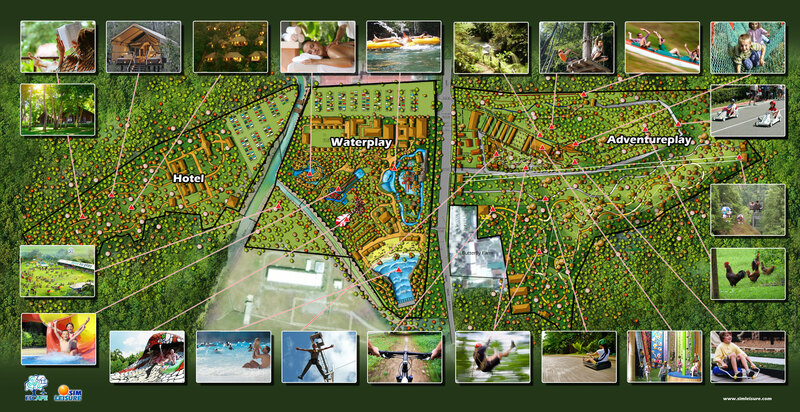 The waterplay still in construction, will be ready in year 2014. May i know is the entrance fees including all activities? I believe that is among the so much vital info for me. And i am glad reading your article. I went there recently. During christmas to be exact. They have a new attraction called Monkey School. Basically it is a scale down version of Monkey Business. My kids love it a lot. 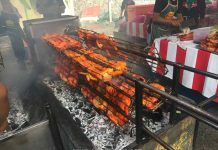 Sharing our experience there at my blog below…. I want to know if my team can get discounts for the ticket? Because we are going about 30 students. We going there for team building and we need a date that you free. This is my teacher’s request, they want this team building program is not disturbing by any public. 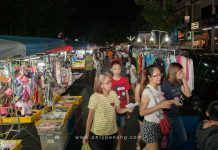 As OnlyPenang only help to promote Penang Escape, maybe you can contact them through the following information about your request? i had agroup 25-30paxs arrival on 5 dec- 8 dec ( for student. so i need suggestion. how long for this them park to breifing.what is the rate for staying . May I know about the price, it still the same or already changed for 2017?